Theaster Gates was born in 1973 in Chicago, USA where he lives and works. The things he creates may stretch the idea of what we think of as art. For example as well as sculpture, installation and performance, he performs makeovers on old buildings! 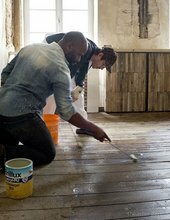 All of Theaster Gates’s art is about one thing – making people’s lives better. He studied urban planning at college, which is the planning of buildings, road systems and neighbourhoods. He uses what he learnt from this to improve and revitalise poor areas of cities. He does this in lots of ways; from doing up old empty buildings so that they become something useful, to organising conferences and other events where people can meet to discuss ways of making society better. This type of art is called socially engaged practice. Socially engaged artists collaborate with other people or communities to try and fix problems and improve people’s lives. Theaster Gates is most famous for his big architectural projects. One of the biggest of these is The Dorchester Project. This is still happening, but began in 2006 when he bought an abandoned building in Chicago. He collaborated with a team of architects and designers to do the building up. This old empty useless building, (and others which he has worked on since then), has been transformed into an amazing, buzzing and very useful place where local people can do all sorts of fun and interesting things. They can borrow books and music from the library in the building, go to concerts and performances, meet others and share ideas and go on swings. Theaster Gates calls his architectural projects ‘real-estate art’. What else do we need to know about his art? Recycling is important to Theaster Gates. He describes his building projects as part of a ‘circular ecological system’. As well as recycling found materials for the renovation of his buildings; the building work itself is paid for entirely by selling sculptures and artworks he makes from old bits and pieces he finds inside the buildings. His art explores the history and culture of black people in America. This artwork by Theaster Gates looks a bit like an abstract painting doesn’t it? But it isn’t what it seems! Look closely. Can you see what it’s made from? (It's made from old recycled fire hoses). As well as recycling, the work has another important message. Theaster Gates made the work about a shocking event that took place in Alabama in 1963. Young black school children were marching peacefully to demonstrate for equal rights, when fire hoses were turned on them. The powerful jets of water injured lots of the children. Theaster Gates uses the fire hoses to symbolise the horror of this awful event. By using events from black history as subjects for his art, he wants to make sure people know about them so they don’t let them happen again. You may not think of food as art…but in Theaster Gates’s hands it is. Along with foodie collaborators, he often cooks Sunday soul-food dinners for lots of different people. Soul food originated in the Southern States of America in black communities. As well as enjoying its delicious flavours, at Theaster's dinners people discuss, question and celebrate the histories of the people associated with it. So it’s food for thought, as well as for the tummy!